Above is a 1930's Lenci Bed doll that I worked on. She had the remains of her skirt and underwear. I researched the doll and came up with this design for a dress for her and made it out of felt. It is not an exact copy of a known Lenci dress but it is in the style of what would have been on her when new. Based on her face and pose I assume she was "little Miss Muffet" being scared by a spider. I had my back-surgery and am mostly recovered. I am feeling much better compared to before the surgery. I am busy on repairs and have worked down the backlog on repairs. I am able to do most repairs where I have the parts in a few weeks at the most. When you wish to contact us about a repair E-mail is always best. In the E-mail about a doll repair you should attach pictures of the doll and if possible close-ups of the damaged areas. Also the size of the doll is useful in assessing the cost of repairs. If parts are broken also indicate if you have the broken pieces (like fingers or toes). Using the broken pieces is often cheaper than rebuilding them from scratch. Most people contact us about the repairs by Email or phone. If you decide to go ahead with the repair we will have you leave the dolls with the sales people behind the sales counter at one of the shops we work out of. The sales people there will give you one of my receipts for the dolls you drop off. The shops have secure storage locations for the doll until we pick them up. We will pick up the work at the shop and contact you to confirm the details of the repair and give you an estimate for the cost. I am not normally in the shops when you drop off projects but can arrange to meet you to discuss a special or complicated repair, if you contact me in advance to make an appointment. If you cannot get to one of the shops I can also have you mail the items to me and I will mail them back to you when they are done. I try to limit the items I repair through the mail. It does not make sense to mail simple repairs like restringing dolls. I also do not want to ship fragile items including bisque head dolls. Please do not mail items to the shops I work out of. I can string Vintage and Antique Composition, Bisque or Hard plastic bodies. On Composition bodies I can repair or replace fingers or toes as needed. I also have access to replacement arms and legs if needed for hard plastic or China dolls. 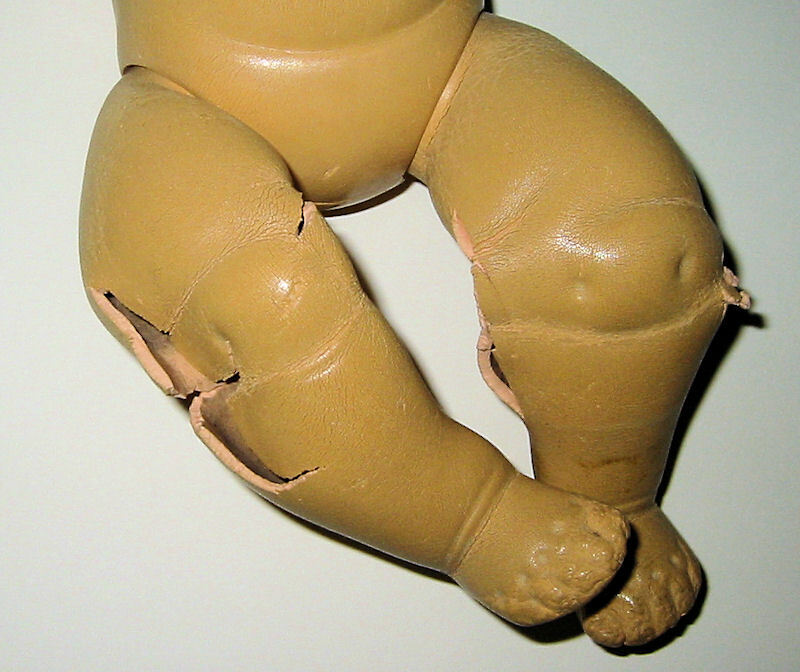 Obtaining replacement arms or legs may take some time depending on the doll. I have a limited number of parts I keep on hand. For others I will need to work with my contacts to obtain the part. In the late 40's and early 50's there were many dolls (like Tiny Tears) made with rubber bodies. Over time these bodies usually split or collapse like a deflated balloon (see picture to the right). Many people say I can work miracles with dolls but unfortunately for these bodies there is no miracle repair. No one is making replacement parts for them. Any vintage doll I could get for parts is usually similarly deteriorated or is so brittle it would be damaged trying to remove parts. I know many of these dolls have tremendous sentimental value to there owners but unfortunately there is nothing I can do to repair them. For some hard plastic and vinyl dolls (especially walker dolls) attaching an arm or leg may not be possible. The internal mechanism of some dolls is not designed to facilitate repairs. In most cases I can reattach the arm or leg with limited movement. For these dolls I will need to evaluate the doll on a case by case basis to see what is possible. It is best to send pictures of the detached arm or leg showing the joint. 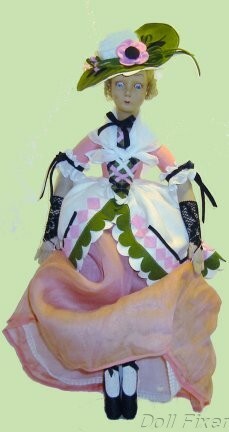 For bisque or porcelain dolls with leather bodies I can repair and re stuff bodies. Over time the kidskin will become brittle and will crack. The stuffing usually sawdust or cork will then leak out. In extreme cases an arm or leg is fully detached. I can patch the bodies and re-stuff them as needed to return them to their original condition. Note that the patches will be visible on the bodies. This is the accepted means of repair for these dolls. While I can usually match the leather patches they will be visible on the body. Please note that while a repaired body will increase the value of a doll it will never have the same value as the doll with a factory mint body. Having said that doing a repair on an old composition doll with sentimental value can have a profound result. I have had customers close to tears when they give their mother or grandmother back their old doll that now looks like they remember from their youth. In this case since the doll is priceless the cost to repair it is inconsequential. I am able to repair or replace eyes in most dolls. For antique bisque dolls I can reset the eyes if they have come dislodged. I can also obtain replacement eyes if they have been lost or broken. Vintage composition dolls from the 1920-1930's often have clouded or crystallized eyes. There are several different techniques I can apply to improve the appearance of these eyes. In most cases they will look better but it is not usually possible to restore them to original factory condition. It is my personal preference is to keep the original eyes and just touch them up a little. I feel that replacing the eyes as some suggest reduces the originality of the doll and thus devalues the doll. If the eyes are missing you should try to find the eyes and any parts of the eye mechanism and bring them with the doll. Finding replacements can take time and is always more expensive than using the original eyes. Your browser does not support in-line frames or is currently configured not to display in-line frames. I am able to clean and mend almost any costume. I can clean and restyle your favorite dolls hair to make it look almost as good as new within the limits of what the wig allows. In extreme cases the hair may be in such bad shape it may not be suitable for restoration. In this case I can provide replacement wigs.